Sample Verdicts and Settlements in Hagerstown | How Much Is Case Worth? Below are sample verdicts and settlements in personal injury cases in Hagerstown (Washington County). Why do we provide these? We believe a review of other personal injury verdicts is illustrative of the value of other similar personal injury cases. But, you can't take this logic too far. Each personal injury case has its idiosyncrasies that make a comparison of cases difficult. So use these and other sample verdicts you see. But, take them all with more than a few grains of salt when you use them to estimate the trial or settlement value of your claim. 2017: $18,774 Verdict. A woman is driving her vehicle when she comes to a stop while waiting to make a left turn. Defendant rear-ends her vehicle, totaling both cars. The woman suffers back and neck pain along with headaches after the accident, and later develops deep vein thrombosis. She claims that the defendant was negligent, and the defendant stipulated to liability but argued the causation of the woman’s deep vein thrombosis with the accident. A jury awarded the woman $11,274 to the woman and $7,500 to her husband for loss of consortium. 2016: $14,640 Verdict. A 42-year-old graduate student is driving her vehicle in Hagerstown. She slows down to allow an ambulance to pass through an intersection when defendant rear-ends her. She suffers neck and back injuries after the impact and files this suit against the defendant. The defendant admits liability but disputes the injuries. A jury awards her $14,640. 2013: Hospital Malpractice Settlement of $200,000. Man falls in his hospital room, striking his face/head on the floor. He suffers a brain hemorrhage requiring tube feeding. He also develops post-traumatic seizures, dysphagia, aspiration pneumonia, followed by hypoxia and intractable seizures, eventually causing his death. Plaintiff's wrongful death lawsuit alleges that the hospital’s failure to have adequate fall prevention measures in place before he fell. According to Plaintiff's expert medical witness, the preventive fall measures should have included a one to one observer or some kind of physical restraint (a Posey bed or posey vest) to keep the man from getting out of bed and falling. The case settled before trial for $200,000. Our lawyers handled this claim. 2011: Car Accident Settlement of $325,000. Married couple is driving through Maryland on Route 70 near its intersection at Route 68 when she is hit by a young woman, pushing them off the road. Woman suffers serious, permanent injuries to her lower extremities. The man suffered less extensive injuries but suffered injuries to the discs in his neck and, perhaps more importantly, the pain and suffering of first thinking your wife is dead and then seeing her taken away in a helicopter without knowing what happened to her. To their credit, USAA took this into consideration when valuing the claim. The woman's case settled for the insurance policy limits. Our law firm handled this case. 2008: Motorcyclist Verdict for $97,000. Plaintiff, a motorcyclist, claims the Defendant driver turned in front of him as the two were traveling in opposite directions. Plaintiff lays his bike down to avoid colliding with the Defendant driver and sustains injuries to his arm and elbow as a result. Defendant driver leaves the scene, but returns shortly after, and claims she merely witnessed the motorcyclist lose control of his bike and stopped to render assistance. The Defendant driver was insured by State Farm Insurance. A jury awarded the motorcyclist $97,000 for the injuries he sustained. 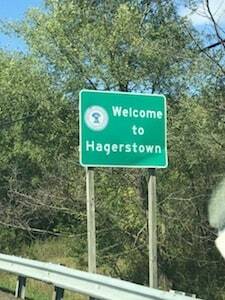 Our lawyers handle serious personal injury car accident, medical malpractice, and product liability cases in Hagerstown. If you have been hurt and need our help, call at 800-553-8082 or get a free initial consultation. More information on how to get your arms around the range of value of your personal injury case.